Learning to drive in Hartlepool with Ignition Driving School will not only be rewarding but will be enjoyable too. With all types of driving tuition courses covered from standard hourly driving lessons in Hartlepool to intensive driving courses, Ignition Driving School can help you on your way. 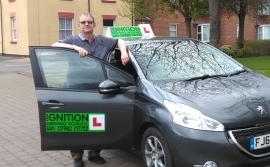 May be you have already passed your driving test and you are looking for a few refresher driving lessons in Hartlepool to help boost your confidence, well look no further, as here at Ignition Driving School we are happy to help. Ignition Driving School started over 10 years ago and understands how important it is to pass your driving test in Hartlepool. Rest assured you're in safe hands with our local, fully qualified driving instructor as he not only knows what it takes to get you through your driving test but he also knows the area well too. He works flexible hours too, so driving lessons in Hartlepool can fit around your other commitments. To ensure that you get the best out of your learning to drive experience with Ignition Driving School, we also have an online support tool, The Hub, where you can come and read up about elements of learning to drive and also practice theory papers and hazard perception clips to help you prepare for your theory test. Your Ignition Driving School driving instructor will be with you every step of the way, and to get you started we also offer the first driving lesson in Hartlepool FREE for beginners, allowing you to learn the controls of the car and get moving for the very first time! Not to worry if you are an experienced learner driver though, our competitive pricing and block booking discounts ensure that you get great value driving lessons in Hartlepool whatever your level. Ian was a brilliant instructor who taught me in a short frame of time as my goal was to complete my test in time for my daughters birth. He managed to do this and in addition to this it was a 1st time pass also. I'd recommend him to anyone I know as his dedication to you as a student was his greatest importance.